Strava (for iOS and Android) is a great app that takes advantage of your phone or GPS watch sensors or dedicated cycling computer to let you track your ride. That means from the basics like speed and distance to more complex metrics like cadence, power and heart rate. But what’s really special is Strava’s use of the community. Since this app is used all over the world, with over 11 million workouts per week, you can theoretically hop on your bike, open the app and find the most popular routes near you. While this is a great way to find new rides it’s also perfect for those that need a little competition to help keep their speed up. You can effectively race against others that have ridden the route before. Strava creates what it calls heat maps, showing the routes cycled by its users the world over. Of course this could be a privacy issue for some riders so there is an option to opt out if you’re on a cheeky ride when you should be working from home. Here’s a guide on how to stay private when using Strava. 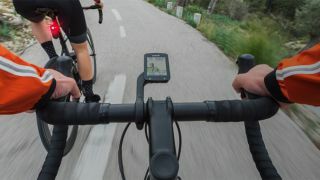 You may have noticed the Garmin Edge 1030 has remained in this list for the second year running. That’s with good reason. Not only is this king of the cycle computers but with updates it’s better than ever. As used by professionals this is the ultimate tracking machine with the ability to hook up to heart rate monitors, cadence sensors and even power metres – heck, you can even control your bike lights using this beast. 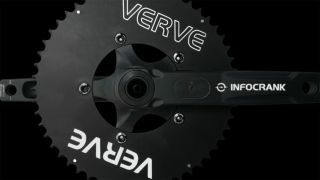 Garmin offers its own cycling insights from its many riders but it also offers the even more widely used Strava for route and lap racing. On top of that you get smartphone connection to let you see all your usual notifications. But there’s also rider-to-rider messaging for those riders in a group with others who are also using Garmin. This means you can send pre-written messages at the tap of a button and when paired with GroupTrack using your phone even lets others find where you are, ideal should you get split up. The Verve InfoCrank isn’t cheap at over a grand but then you really do get what you pay for when it comes to wattmeters, aka power meters, and this is one of the best. British Cycling thinks so, as this is what it uses. That means a super clear way to see power so you can work on getting the most efficient use of your legs on every ride and keep making improvements on your road bike ride times. All while adding a mere 691g to your overall bike weight. This does pose a real effort for the install job, so swapping between bikes is going to cost you time. Since most people will likely install this system and leave it, this isn’t a massive negative, but worth a mention. Overall accuracy for power is an impressive +/- 1% meaning you can really rely on these readouts. Only cadence can be an issue where freewheeling puts it out of whack for your average. But that just motivates you to keep cycling more, right? So it’s a win-win. 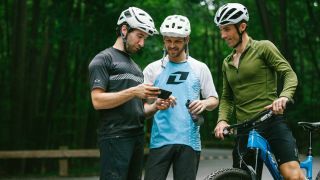 Get instant feedback on metrics like speed and heart rate thanks to built in sensors and smartphone connectivity. Want to hear your cadence? Just tap the earbuds and you’re read out the figure. There’s also a nifty surroundings mode that lets you hear what’s going on about you, ideal at busy junctions or if you want to chat to fellow riders. Of course, being smartphone connected, you could call them using voice dialing too. If you’re riding abroad these have another special skill you could use – real-time translation. Yup, you can talk to someone in another country and have their responses translated in your ears for a Star Trek style conversation – ideal if you’re lost in the Alps somewhere. If it’s cold, wet and dark outside, the motivation to get yourself kit on and hop on the bike can be pretty nonexistent. Top help keep your fitness up during these bleak months in anticipation of warmer conditions is where smart turbo trainers come in. Like normal turbo trainers they allow you to hook your bike up to them and do a focused training session in the comfort of your own home (or shed or garage). 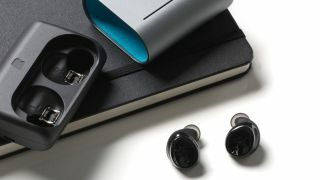 However, smart turbo trainers take this one step further thanks to their ANT+ and Bluetooth connectivity. This allows them to speak to your smart device or computer, allowing to do anything from remotely setting the resistance or mimic a ride profile (including ascents and descents) via specially designed apps like Zwift. It’s incredibly easy to set-up, and while it’s pretty heavy at 22kg, it can be easily folded and stored once the sun comes out. We used it with Zwift and it gives a realistic feeling, with ascending a 10% climb feeling like a 10% climb. It’s probably not quite as stable as some for some real hard efforts out of the saddle, but overall this is hard to beat. 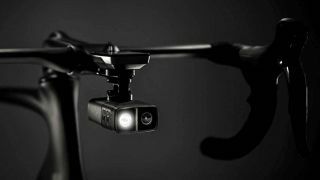 The Fly12 CE from Cycliq is not only a power 600 Lumen front bike light, but it’s also a very good action camera that’s great for recording your rides from the cockpit. Video is recorded at 1080p up to 60fps in either 5, 10 or 15 minute chunks, while there’s a 6-axis image stabilization system to deliver smooth footage. If you fill up the card, the Fly12 CE will automatically overwrite the oldest video. Don’t worry though, you can lock footage, so whether you want to keep a record of you smashing it up your favorite climb or you want to note the number plate of the guy who almost ran you off the road, you can. There’s also an ‘incident mode’ – if the Fly12 CE tilts over 60 degrees (falling off your bike in most instances), it will automatically lock and store the footage immediately before and after. Alongside this is a powerful 600 Lumen light with 10 settings, and thanks to ANT+ connectivity, you can connect this to your Garmin cycling computer to control the Fly12 CE on the go. There’s also a handy app as well that provides greater control over the camera/light. Waterproof down to 1m, it should stand up to some wet rides, while the battery life is good for 8 hours (4-5 hours if you’re going to be using the light as well). It’s better than a helmet in that it’s less obvious and more comfortable than strapping something to your head. It also means you can stay cooler in the summer periods when strapping a helmet on in an instant sweat-inducer. But, most importantly, the company says this offers eight times better protection than a traditional helmet. The Hovding will track the wearer’s movements 200 times a second. That way it can detect an abnormal movement, of a crash, to instantly deploy to protect the cyclist. This is smart enough to know the difference between bumping a curb or stepping off suddenly. That’s a very necessary feature as once this has deployed, that’s your lot. Yup, despite the price, this is for one-time use. To be fair, helmets should be replaced after a crash too so when you look at it like that, this is fine. 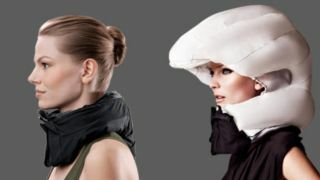 Also, since this offers neck protection too, it’s technically safer than a helmet. The downside? You’ll need to charge it after nine hours of riding.